This California 210 freeway entrance shield stands at State Street interchange in western San Bernardino near Muscoy. Photo taken 06/24/07. Interstate 210 in California is the Foothill Freeway between Interstate 5 (Golden State Freeway) in Sylmar and California 57 (Orange Freeway) in Glendora via Pasadena. At California 57, Interstate 210 changes into California 210, and the state route continues east from there to San Bernardino, ending at Interstate 10 in Redlands. The section between I-215 and I-10 was still signed as California 30 until March 2008, about eight months after the final segment through Rialto was completed on July 24, 2007. Plans called for the addition of the entire SR 210 freeway to the existing Interstate 210 from San Dimas east to Redlands upon completion of the last segment of freeway. Interim changes replaced signs for SR 30 with SR 210 markers by March 2008. The process to add former SR 30 to Interstate 210 began in 1998, when the designation of the state route was legislatively changed to SR 210. Then on November 6, 1998, the state of California submitted SR 30 for inclusion in the Interstate Highway System. 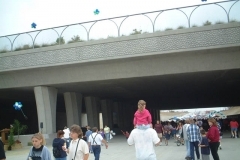 AASHTO rejected this proposal because the freeway segments were not complete. As of 2018, the freeway was not resubmitted for approval. Interstate 210 (Foothill Freeway) was planned in the 1940s, commissioned in the mid-1950s, and completed in stages through the 1960s, 1970s, and 1980s. California 210 (the state route section east of California 57) was completed in July 2007. As portions were completed, parts were signed as California 118 northwest of Pasadena and U.S. 66 east of Pasadena according to maps from that era. Once the significant portions of the route were completed, Interstate 210 markers were erected. 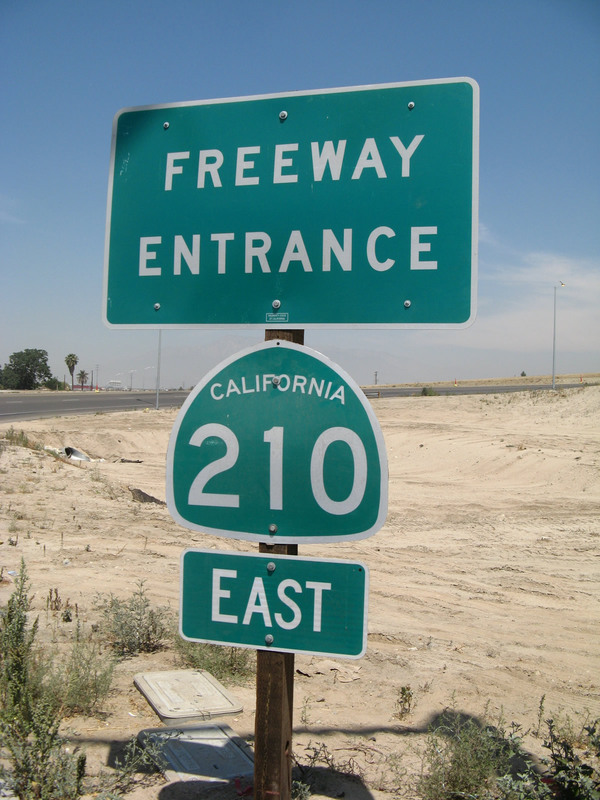 With the opening of the final link of California 210 on July 24, 2007,1 the combination of Interstate 210, California 210, and California 30 offer a continuous freeway link from Los Angeles (San Fernando Valley) to Redlands. It is not clear when the California Department of Transportation (Caltrans) will request an Interstate 210 designation for the entire freeway route. Prior to the legislative conversion of the former SR 30 corridor into SR 210, a short section of Interstate 210 used to extend from the current SR 57 and SR 210 interchange in San Dimas south to the Kellogg Interchange, where I-10 (San Bernardino Freeway), SR 57 (Orange Freeway) and SR 71 (Corona Expressway) come together in Pomona. The section of Former Interstate 210 between these two points is now signed as SR 57 (Orange Freeway) and is legislatively part of SR 57. This truncation was performed in preparation for the conversion of SR 210 into Interstate 210. The legislative change that extended SR 210 east and eliminated SR 30 occurred in 1998 as a result of California State Assembly Bill AB 2388. However, signage changes came in stages after this legislative action. By 2008, all SR 30 references were eliminated from freeway segments, although some route markers remained in place along select portions of Highland Avenue through 2009. The completed freeway segments were signed as SR 210 as of 2009. Prior to the spring of 1992, when the full facility was completed, California 30 -- west to east -- looked like this: freeway to the present Highland Ave. interchange in east San Bernardino, east on Highland to Boulder Avenue (the California 30/330 intersection), where it turned south. It went south on Boulder to 5th, then turned west on 5th to the freeway alignment, then went south again over the eastbound two lanes across the Santa Ana River watercourse, extending south to San Bernardino Avenue in Redlands. At that point, traffic was shunted off onto that street east to the east side of the freeway berm, where it turned south onto Tennessee Street (which had been extended north circa 1982-83 to serve as a frontage road for the California 30 freeway, as it does today) and thence to the Interstate 10 interchange. Some maps of that era showed California 30 temporarily extending east all the way to Orange Street (the original state highway alignment) then south to California 38 at Lugonia Street, where it terminated. While this may have been the officially designated alignment (Caltrans ceded the part of Orange Street that dipped into the Santa Ana River bed over to the local jurisdiction), signage from California 30 east directed traffic heading to Interstate 10 directly down Tennessee Street (and, if you have been that way and paid notice, there is room on the overhead signage for the Tennessee St. exits on Interstate 10 -- in both directions -- for a state highway shield). Signage from Interstate 10 to California 30, if my memory from the mid eighties serves me correctly, was rudimentary at best: I seem to recall nothing indicating California 30 at the Interstate 10/ California 38/ Orange Street interchange in central Redlands, but one solitary stand-alone sign before the Tennessee Street off-ramp reading, from top to bottom "to", California 30 (shield), "NEXT RIGHT" in a small square green sign under the shield. And that didn't last long, since that was also the site of construction of the Interstate 10/California 30 interchange, and the shield sat where Interstate 10 was being widened to accommodate the two-lane ramp exit to California 30. The last segment of California 210 opened on July 24, 2007, through Rialto and Muscoy.1 For the ensuing five years, the interchange between Interstate 215 and California 210 was under construction. 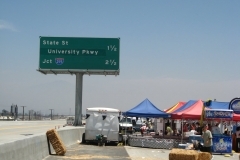 The final link, which connects California 210 east to Interstate 215 south, opened to traffic on July 23, 2012. Prior to this ramp opening, this connection required a lengthy detour along Highland Avenue. Northbound Pasadena Avenue at Interstate 210, which travels east to San Bernardino and west to San Fernando. Photo taken 06/19/10. This Interstate 210 button copy shield is posted on a green guide sign located at the intersection of Corson Street and Walnut Street in Pasadena. Photo taken 06/19/10. Westbound Historic U.S. 66 (Colorado Boulevard) approaches the on-ramps to California 134 west and Interstate 210 east in Old Pasadena near the Norton Simon Museum. Photos taken 06/19/10. This I-210 freeway entrance shield assembly was posted at the folded diamond interchange joining the Orange Freeway with Via Verde in San Dimas. It was eventually replaced by a SR 57 assembly, following extension of the state route northwest from the Kellogg Interchange to the Foothill Freeway. Photos taken 05/01/02. Replaced button copy sign sign for the loop ramp to SR 57 (former I-210) east to the Kellogg Interchange on Via Verde in San Dimas. Photo taken 05/01/02. Interstate 210 trailblazer posted along northbound Lone Hill Avenue in Glendora prior to Auto Centre Drive. Photos taken 11/14/04. An increasingly frequent occurrence in Caltrans District 7 was finding signage displaying "CALIFORNIA" where "INTERSTATE" should be in crown of an Interstate route marker. This assembly appeared along Lone Hill Avenue north in Glendora. Photo taken 11/14/04. The two-wye interchange with SR 57 (Orange Freeway) south overlays the diamond interchange joining Lone Hill Avenue with the Foothill Freeway in Glendora. Interstate 210 transitions to SR 210 east from SR 57 to San Bernardino. Photos taken 11/14/04. This view looks west toward the Foothill Boulevard cut and cover tunnel (Memorial Park) and California 2 (Glendale Freeway) interchange along Interstate 210 from the Angeles Crest Highway overpass in La Canada Flintridge Photo taken 03/25/07. Northbound San Dimas Avenue at the on-ramp to SR 210 west. The older, button copy sign showed I-210 west, perhaps owing to an older Caltrans District 7 standard of signing the route designation a mile or two away rather than the actual route intersected here. Note that the control cities are Pomona and Pasadena. While SR 210 travels west to Interstate 210, SR 57 travels south to Pomona. Photo taken 11/14/04. Fruit Street north at SR 210 in La Verne. An overlay on this reflective sign covered a shield for Interstate 210. Photo taken 09/28/02. SR 210 freeway entrance assembly at Fruit Street in La Verne. Photo taken 09/28/02. The unopened SR 210 (Foothill Freeway) below the Fruit Street over crossing in La Verne. Photo taken 09/28/02. Parker, Scott. Personal Email: "210 Opening Next Week," July 20, 2007. Parker, Scott. Personal Email: "RE: 210 opening next week," August 15, 2007. Moon, C.J. Personal Email: "210 Dates," August 25, 2007. Twiss, Adam. Personal Email: "RE: Interstate California 210," August 15, 2007. Ramp opens as more I-215 closures planned by Dug Begley, The Press Enterprise, July 25, 2012. Relevant quote: "The last direct link needed between Interstate 215 and Highway 210 is complete, as part of an ongoing $700 million freeway widening through the city. Drivers can now go directly from the eastbound 210 to southbound I-215, via a ramp that opened Monday, July 23."